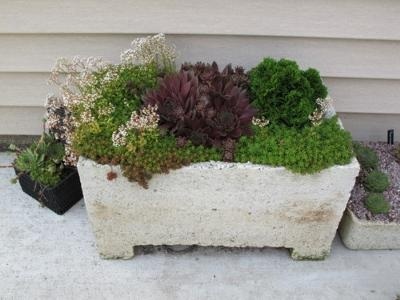 Trough gardens can add a new dimension to your xeric garden. They add depth, and height to areas such as patios or decks, and colour and texture amongst other containers. Planting Sedum, Sempervivum and other rare hardy succulents and alpine plants in trough gardens is a time honoured tradition. In the past, the most desirable troughs were granite sinks and water troughs from old farmhouses, which are nowadays very difficult to find, and pricey. 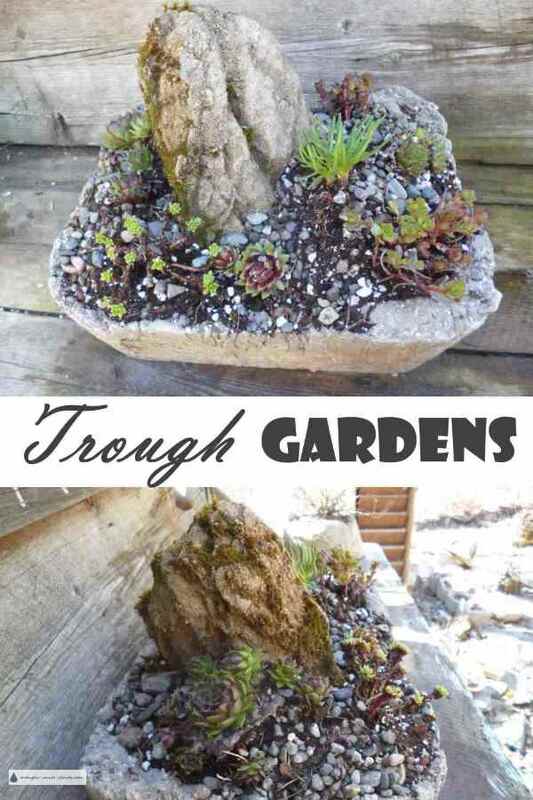 A good substitute developed by avid alpine plant growers is hypertufa, made from cement powder and peat moss, formed into a shape either by hand building or in a form. Treasures such as Jovibarba and many other alpine plants require extremely ‘sharp’ drainage, meaning absolutely no water may puddle in their soil at all, and are at their very best in trough plantings. 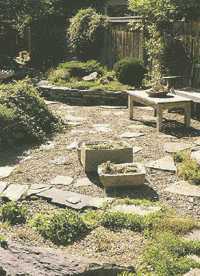 The soil can be regular garden soil, mixed half and half with rough gravel or large sand. No fines or dust can be in the soil, as this will clog the pores of the soil and prevent the fast drainage these plants demand. Sieve your soil through hardware cloth or window screening, then mix it with the drainage material and add it to the trough in a mound. Mounding the soil and adding stones to emulate a cliff or mountain outcropping gives more dimension to the planting, as well as improved drainage. Mulching with stone chips, lava rock or pebbles will keep the soil cooler and prevent moss, weeds or algae from growing on the surface of the trough garden. Moss and lichen on the outside of the trough is usually encouraged; spraying buttermilk, yogurt or liquid manure on will help it get established. Look at this site for more information on how to make hypertufa look old. The trough must have a drain hole or several in the bottom. Place the trough on two bricks to raise it off the ground. Move the trough into place before filling it with soil, as it will be very heavy. Plants that will thrive in a trough in full sun are Sedum, Sempervivum, Jovibarba and thyme, as well as many other alpine plants such as Saxifraga, Dianthus and Campanula. I like other little beauties such as Lewisia which have spectacular flowers when they're happy. Look for those plants that remain very small both in height and spread, sometimes indicated by the use of species names like 'nana', 'nanum', 'pumila', 'minus', 'minima', or 'pygmaea'. For more information about alpine plants a good source is The Complete Book of Alpine Gardening, by Richard Bird and John Kelly, ISBN 0 7063 7023 6. 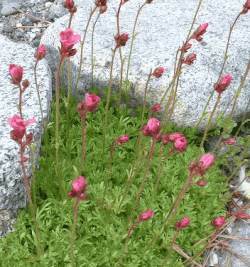 Avoid any plants that have a reputation of being a garden thug, as putting them amongst delicate and well behaved alpine plants won’t change their nature, they’ll just take over. The special care you’ve put into making or finding your trough should carry through to choosing only those plants that are choice and rare.